Impressionable journalists finally meet George Stigler. Oct. 5, 2014 5:28 p.m. 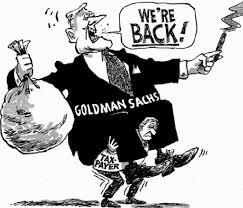 ET The financial scandal du jour involves leaked audio recordings that purport to show that regulators at the Federal Reserve Bank of New York were soft on Goldman Sachs . Say it ain’t so. The news is being treated as shocking by journalists who claim to be hard-headed students of financial markets. One especially impressionable columnist calls it “a jaw-dropping story about Wall Street regulation.” The real scandal here is the excessive faith that liberal journalists and politicians continue to put in financial regulation. The media pack is discovering regulatory capture—a mere 43 years after George Stigler published his landmark paper on the concept. The secret recordings were made by Carmen Segarra, who went to work as an examiner at the New York Fed in 2011 but was fired less than seven months later in 2012. She has filed a wrongful termination lawsuit against the regulator and says Fed officials sought to bury her claim that Goldman had no firm-wide policy on conflicts-of-interest. Goldman says it has had such policies for years, though on the same day Ms. Segarra’s revelations were broadcast, the firm added new restrictions on employees trading for their own accounts. On the recordings, regulators can be heard doing what regulators do—revealing the limits of their knowledge and demonstrating their reluctance to challenge the firms they regulate. At one point Fed officials suspect a Goldman deal with Banco Santander may have been “legal but shady” in the words of one regulator, and should have required Fed approval. 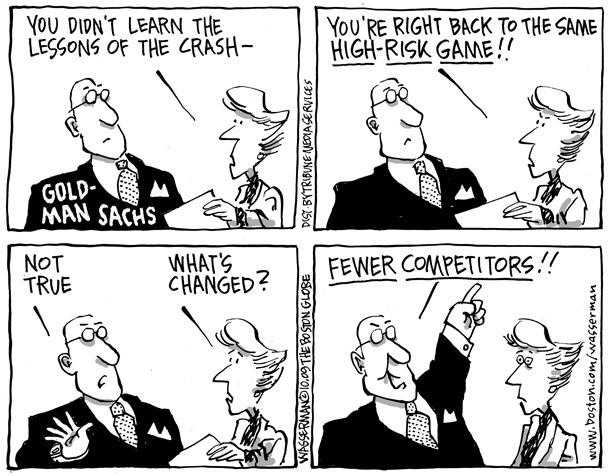 But the regulators basically accept Goldman’s explanations without a fight. In this case it appears a regulator was helping Goldman even when Goldman didn’t need any help. That’s because the securities laws have long sought to provide the most protection to investors of modest means. For example, a company offering securities is exempt from some registration requirements if it is only selling to accredited investors, such as people with more than $1 million in net worth, excluding the value of primary residences. The journalists have also found evidence in Ms. Segarra’s recordings that even after the financial crisis and the supposed reforms of the Dodd-Frank law, the New York Fed remained a bureaucratic agency resistant to new ideas and hostile to strong-willed, independent-minded employees. In government? Stigler knew he was fighting an uphill battle trying to persuade his fellow academics. “The idealistic view of public regulation is deeply imbedded in professional economic thought,” he wrote. But thanks to Stigler, who would go on to win a Nobel prize, many economists have studied the operation and effects of regulation and found similar results. A classic example was the New York Fed’s decision to let Citigroup stash $1.2 trillion of assets—including more than $600 billion of mortgage-related securities—in off-balance-sheet vehicles before the financial crisis. That’s when Tim Geithner ran the New York Fed and Jack Lew was at Citigroup. Once one understands the inevitability of regulatory capture, the logical policy response is to enact simple laws that can’t be gamed by the biggest firms and their captive bureaucrats. This means repealing most of Dodd-Frank and the so-called Basel rules and replacing them with a simple requirement for more bank capital—an equity-to-asset ratio of perhaps 15%. It means bringing back bankruptcy for giant firms instead of resolution at the discretion of political appointees. And it means considering economist Charles Calomiris’s plan to automatically convert a portion of a bank’s debt into equity if the bank’s market value falls below a healthy level.